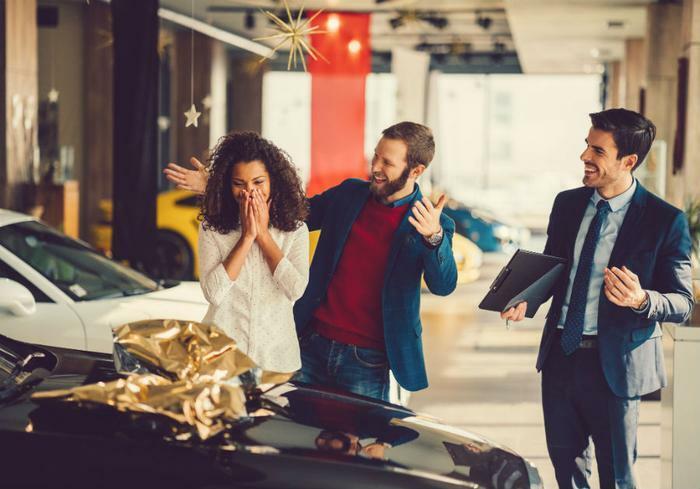 The nation's car dealers are making a bid for a bigger slice of Black Friday spending this year by rolling out dozens of deals they hope will entice holiday shoppers into new car showrooms. If past years are any indication, the strategy will work. People in search of a good price on a new set of wheels may bypass the mall this year. If you're looking for an SUV, your Ford dealer will be offering zero percent financing for 60 months and $1,500 cash back on a 2018 Ford Escape. It comes with Ford's MyKey, a 4.2-inch display screen, Bluetooth, voice recognition, and a USB port. Options like navigation and adaptive cruise control are part of a higher trim level. The 2019 Kia Sportage also comes with interest-free financing for 60 months but lacks the cashback offer. The base model comes with a USB port, satellite radio, and a five-inch touchscreen with Bluetooth. If you upgrade to a higher option package, you get a seven-inch touchscreen with Apple CarPlay and Android Auto. Kelley Blue Book (KBB) has highlighted a handful of attractive new car deals available in November, all of which will be offered on Black Friday. Acura dealers will be offering the Acura ILX on a 36-month lease for $199 a month. It requires $2,499 down. For economy-minded shoppers, your Ford dealer is offering $4,000 cash back on the purchase of a Ford Focus. According to KBB, the car sells for around $18,661, meaning you can drive it away for less than $15,000. Ford is offering $5,000 cash back on the purchase of a Ford Explorer, which KBB says you should be able to purchase for just under $32,000. Chrysler is offering $4,500 on the Jeep Cherokee, with a Fair Purchase Price of just under $30,000. If you're in the market for an SUV, November is a great time to buy or lease with cash back and lease deals on top models," said Allyson Harwood, associate editor for KBB. "The Toyota RAV4, Mazda CX-5, and Hyundai Tucson offer great value and practicality in a small SUV package. The Ford Explorer and Jeep Grand Cherokee offer more room at a higher price point, but the savings this month could make them more affordable and worth a closer look." Despite the competitive deal-making, new car sales have slowed in recent months -- reportedly because of market saturation. But a survey by Capital One Auto Finance suggests another possible reason. It found consumer concerns over the current car buying process, particularly transparency and the time it takes to make a purchase. "The car-buying process does not need to be a source of stress. And this current state of trust and transparency in car-buying needs to be addressed," said Jeff Rabinowitz, managing vice president of Capital One Auto Finance. The survey found only 6 percent of buyers think the process is completely transparent. Only 20 percent said they feel "very confident" when shopping for a car.